Smith's announcement follows the news that his hockey flick Hit Somebody will now be turned into a six-part miniseries on an unannounced network. 2014 marks the 20th anniversary of the original film, which was shot in a convenience store and continues to have a cult following. 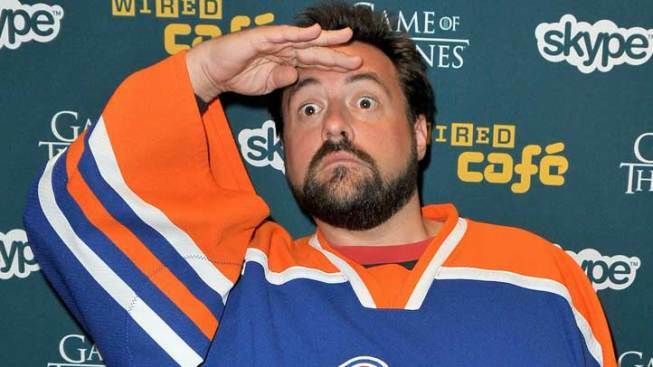 Kevin Smith is hoping to leave the movie biz on a high note. The director has revealed plans to release what he expects will be his last directorial effort: Clerks 3, the final installment in his slacker saga that began with the 1994 flick that put the indie filmmaker on the map. "So with the HIT SOMEBODY shift, the minute Jeff Anderson signs on, my last cinematic effort as a writer/director will be CLERKS III #TaDa," he tweeted. 2014 marks the 20th anniversary of the original film, which was shot in a convenience store and continues to have a cult following. The movie is responsible for launching Smith's career, and he'd later go on to direct indie staples like Chasing Amy, Dogma and Jay and Silent Bob Strike Back. "Instead of letting people [guess] for years, I said, 'I will do Clerks 3, and by 2014 it is the 20th anniversary. We're going to mark it somehow, God willing, with Clerks 3," Smith said in an interview with Good Day LA. "We need Jeff Anderson to come back and say yes." Now we want to hear from you: Would you go see Clerks 3? Sound off in the comments below!